I found a great Asian Spinach Salad recipe on This Week for Dinner by Kristy at Table for 7. 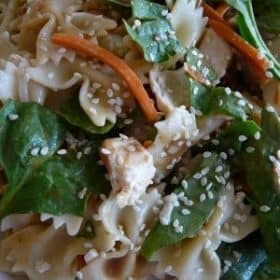 I rarely make my own salad dressing and Kraft has an Asian Sesame dressing that we really like, so I change the recipe to make it super quick and easy using the bottled dressing and rotisserie chicken. It was a big hit with my family. Toss all ingredients together, serve with Asian Toasted Sesame dressing, top with sesame seeds.